There is an infinite competition that’s stays ahead for Mobile Apps Companies in Chennai for marketing apps and business. Generally this is dealt using three different criteria’s for developing a mobile app and the primary factor is the decision to make either a MVP or EVP Product. Next step is to determine the most suited mobile operating systems that is beneficial for creating the business hype. Then come the last stage of getting acquainted with the overall thought process of probable customers. Nearly around 2.5 million smartphone users across the Chennai are engaged with mobile apps utilities and hence it should be built with most essential features that exhibit high performance. Essentially the App development company needs to deliver the most disruptive mobile app technology to reach the most probable customers and to monetize the app. It becomes vital for businesses to select the best-in class Mobile App Development Companies in Chennai. Why Chennai is preferable for Mobile App Development? Whenever there is a constant change in business environment and customer preferences, company owners should now get aware of the latest choices and trends. Many companies prefer Chennai for their mobile app needs since it has the good number of Mobile App Development Companies that adopts to contemporary mobile app development practices. Get the expected product UX and then achieve surplus app marketing to prevent rejections from users end. Traditionally, Chennai has the versatile list of mobile app companies that can rank your businesses to a top position by retaining all your customers connected and answered to their demands. Most important part in App development is Mobile App marketing, whether it be a Minimum Viable Product or Exceptional Viable Product. According to it the popularity of Mobile Apps would get reflected. Most of the Chennai based companies allow you to know about the user behaviour analytics and app performance before initiating the mobile app development process. 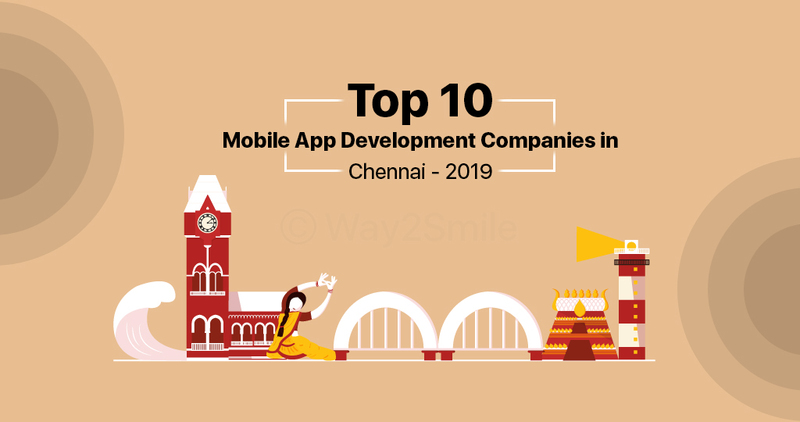 Way2Smile is a Mobile App Development company located in Chennai, India offering mobile app solutions for enterprises, SMEs & Start up’s under 100+ different Portfolios. Our development team consist of highly experiential Designers to Full-Stack programmers. Way2Smile begins the Mobile App planning in advance and builds mobile apps that resonates some of the leading industry concepts. Macappstudio a million dollar mobile app Development Company that engages in creating multi-million dollar apps for its clients. We are the recipient of Most Valuable Developer Award from Intel Software Division. Some of our created mobile app displays a stunning look and features that makes people lives simpler and easier. We already have over 120 apps present in every single platform and mobiles. Macappstudio is well aware about developing mobile apps in shortest span of time at minimum cost. Hakuna Matata Solutions is a Mobile Apps development company based in Chennai, providing services for over a decade past. Silicon India has rated our company in the Top 10 list of Mobile App development Companies. Hakuna Matata Solutions is responsible for developing over 250+ Portfolios that includes Mobile App Solutions. We work with some of the enterprises like e-commerce, Education, Travel and Professional Services. Contus is a mobile app solutions company that can readily launch business ideas into mobile responsive market. We work in some of the evolving technologies like IoT, wearables, Beacons and Augmented Reality to improve business efficiency and sales. We have served an array of industries like manufacturing, automobile, advertising, food, and retail space. Contus has been a major player in custom app development and have earned leading clients from Accenture, World Bank and Mahindra Motors. Colan Infotech a highly preferred mobile and web development company for overseas clients. We are an offshore IT services provider built for small and medium sized enterprises to get profited. Colan Infotech has some of the creative minds and acumen for technical proficiency to clearly map out every requirements of the clients and businesses. Our mobile apps are completely agile, functional, and aesthetic solutions. Pyramidion have some expertise and laurels in developing Mobile and Web Applications that is deliverable for enterprise IT firms. Our mobile app experts try to assemble imaginative computerized items and machine learning algorithms to put the Client’s product to the first position. Pyramidion is always sure about the mobile app designed that is made for its client. Idea2IT Technology is a Mobile App Development Company that have a number of craftsmen’s to engineers developing products for start-ups and SMEs. Our work methodology begins with client engagement, design wireframes, and progressive scaling that affords us to engineer some of the most beautiful mobile apps. Ideals2IT Technology was founded in 2008 and it has around 400+ projects up until today with world class clients like Microsoft and Ericsson. Team Tweaks is highly acclaimed to be among the best in Mobile App Development firms in Chennai. Our developers work vigorously to bridge the user requirements and client’s app idea to provide the importance of existence and growth. Team Tweaks Technologies also has the professional full-service in design Web Apps for its Client’s. Smarther is a leading Mobile and Web Development company producing some of the multi-million apps for its client base. Our clients are widely spread across 20 different countries and are a consistent benefactors of innovative solutions that is offered by us through mobile app products and services. Smarther Technologies have successfully delivered over 250+ mobile apps and websites. Mavin Apps is a mobile app and game development company that is fortified by 30+ software developers and 100+ portfolio apps. Mavin Apps and Technologies was founded in 2011 and is present with the only office in Chennai. We are specialised in designing native apps, games, hybrid apps, responsive websites and web services. When you have to market business mobile apps try to ensure that it stands out among the crowd and target audience interest to download and share the app. Clearly define the objectives, understand the target market and then choose the viable technology platform for mobile app developments. Delegate the app development tasks to a skilled and efficient company and obtain the benefits of Enterprise Mobile Apps. Prudently select any one of the above Mobile App Development company and then create the much hype for your business app in play store with high ratings. This list of Top 10 Mobile Apps Development Companies are shortlisted and compiled based out on their strengths, portfolios handled and ranking achieved over Search Engines. If your company is likely to create a similar hype among mobile app developments then please forward your company profile to us for a transparent evaluation and selection process. How to create a hype for your app right from the beginning?